One Arm window Sill Press. Great exercise for triceps, although this will hit the shoulders, chest and upper back. Start with 6- 8 reps and when you have mastered 12, move on to slow motion reps for building muscle with no weights. This throws everything on the shoulders an upper chest, triceps will not get left out of the mix. 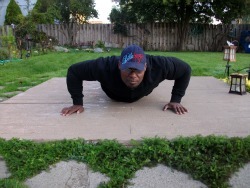 Get yourself up to 10 reps on the first pit stop and then move up from there. Hits that hard to reach area of your upper chest. The wider your arms are apart , the more it will hit the shoulder area. The closer the grip the more likely it will hit the inner upper chest. Great Old School exercise for the back area, change the grip and your hitting the biceps flush. Work your way up to 15 reps, then try some advance training on this exercise.